Crafts, Ideas and Stenciling Resources! ... I have to admit that the most satisfying part of building this web site is the chance that I get to connect with so many other talented artists. They are an inspiration to me. As a one stop source for all of your stenciling art, we've developed an exclusive line of downloadable and Printable Stencils. Instant gratification at its finest! You don't need a special printer - these designs are specially formatted to print straight from your home computer on standard letter sized paper. Once downloaded, you will have your complete stencil booklet with patterns and instructions. Just click, buy and print! 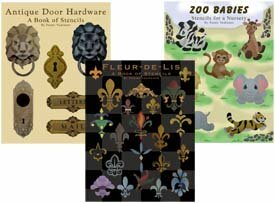 If you'd rather your Stencil Pattern Books in Print (like these) then visit our Printer's Book Shop for a large variety of stencil collections. These books are easy to follow and come with complete instructions. You'll find all of the stencil designs used as samples throughout this site. Art At Home Studio is a wonderful place to find two talented artists who are sharing their art ideas for decorative painting, decoupage, stenciling, scrap booking and altered arts. Royal Design Studio has a beautiful line of decorative stencils. You'll even love the web site. It's packed with great how to information and inspiration rooms that have been transformed with stencils. But it doesn't stop there. They also carry many of the supplies that you will need. Visit a World of Innovative Designs at Stencil Planet! They offer an extensive selection in their catalog and if you don't see it there, they'll custom design it for you! If you're in the mood for cheap arts and crafts then check out our many free stencils to print! When crafters get motivated to create, they don't want to wait. I know! 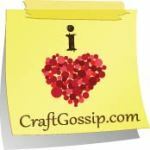 Another great source for free patterns and tutorials for all Seasons is Craft Ideas.info! Whether you would like to make a few decorations for the home, a gift for a friend, create a special card to send birthday wishes or even find projects to make with the kids, here you will find plenty of ideas to keep you busy and creative throughout the whole year. Well, here's that great video I promised you. I hope you like this project idea and come back for many more. Enjoy! Return to Home Page from Links for Arts and Crafts.